I just moved away from the Oakdale neighborhood (aw, miss you already roomies!) and, while compared to one of the Ends or downtown, there's not much out by USM and Woodfords corner, there are a few places worth venturing out Forest Ave. for. 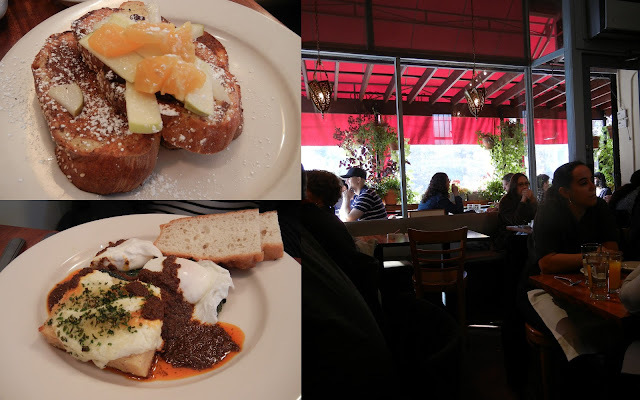 My roommates introduced me to Bayou Kitchen, and it's been my go-to brunch spot for a while now. Well, specifically when I'm craving huevos rancheros. Bayou Kitchen serves the best one I've found in the city. 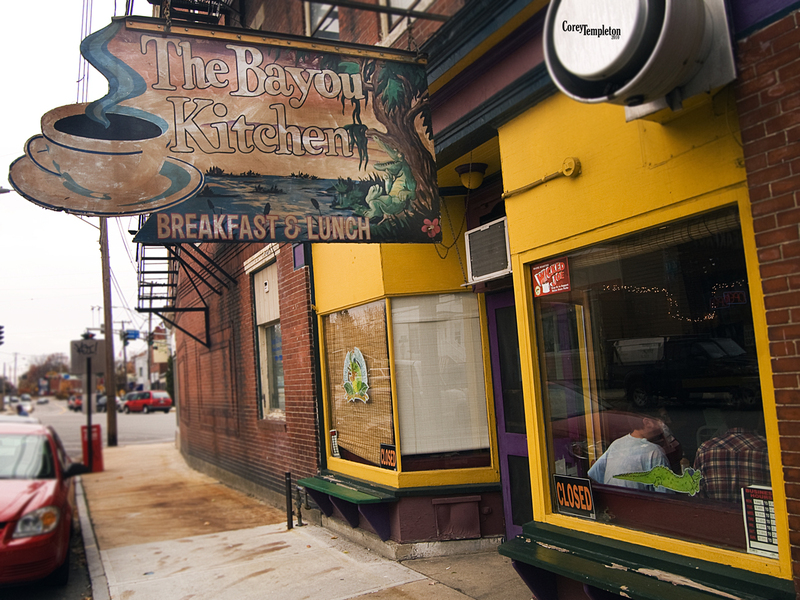 But Bayou Kitchen is easy to miss. It's across Deering Ave. from Artist & Craftsman Supply in a small, unassuming storefront. Once you step inside, you're greeted warmly and seated at one of the 25 seats in the place. The menu has a Cajun bent, with grits Andouille sausage, Jambalaya, and Gumbo. Like I said though, I've only ever had the huevos rancheros. Lots of black bean or beef chili and cheese, wrapped in a tortilla, topped with two eggs, sour cream and salsa. Pretty much all my favorite things together. And then your choice of home fries or grits (skip the grits). This is quickly turning into one of those one-plate places for me. You know the sort, where the one item you've had is so good you're afraid to order something else for fear of disappointment and regret. And I usually have enough of those served up with my morning after brunch as is. But maybe I can return for lunch and not be tempted by the huevos rancheros; after all, they serve gumbo and Jambalaya, which might sway me. So check out Bayou Kitchen for a brunch that's a bit different than the tried and true served up at Becky's, Miss Portland Diner, Marcy's, etc. Between the charming service and the southern food, I bet you'll find something that makes you want to return. Pro tip: due to the size of the restaurant, I recommend getting out there early, as I've seen crowds piling up outside after 10am or so. The third annual Obscure Holiday Cocktail party was a raging success! For the third (!!!) year in a row, local Portland bloggers gathered, each bringing an obscure holiday cocktail. We had five cocktails, and only one (mine) was a bit iffy. Fortunately it came at the end of the evening, when no one cared too much. As usual, thanks to Uke for the cheese pairings. Spot on, natch. The Christmas Bellringer, paired with a Caprichio De Cabra, a goat's milk cheese, was a delicious mix of Gin, Cointreau, Frangelico, and freshly squeezed orange juice. Adam Dawn (whoops!) of Appetite Portland contributed this cocktail and with its refreshing citrus and herbal flavors. The salty feta-like cheese was a nice foil. I could have drank A. of Portland Food Map's cocktail all night long- a Greek Air Mail. A traditional Air Mail has rum, but A. substituted in Greek Metaxa (a brandy-wine blend). Shaken up with lime juice, honey, Q Tonic, Bitters and mint, the Air Mail was not too sweet or boozy- a totally drinkable cocktail. These drinks would make a good pitcher specialty drink for your holiday or New Year's party. The Air Mail was paired with Keen's Cheddar, an English clothbound aged cheddar. I mean, clothbound cheddar. How can you go wrong? The Lion's Pride, made with St. Germain, Gin, one egg white, dash Peychaud Bitters, Lime juice, and topped with lime zest and black pepper was adapted from a cocktail that Dawn and Adam had at Lion's Pride Pub in Brunswick. This cocktail was spicy, citrusy, and floral/herby, and made me want to get to Lion's Pride even more. S. paired it with Valencay, a fresh goat's milk, covered in charcoal ash that was almost like a goat cheese mousse. It was... strange, but stood up to the tartness of the cocktail. Whispers of the Frost, by Vrylena, was Bourbon, Sherry, Port, powdered sugar, served with slices of lemon and orange. I did not witness the particular alchemy that made these ingredients taste like a citrusy mulled wine, but it was strong and delicious. Perfect for sipping at night in front of a foggy window as you watch the snow fall on the pines. Paired with a Bayley Hazen Blue, a raw, aged, cow's milk blue from Jasper Hill Farm in Vermont, a drier, saltier blue, helped to tone down the alcohol-y notes in the cocktail. A nice nibble. Finally, my contribution of the evening, Tom and Jerry, a frothy egg, milk, bourbon, rum punch. It's like egg nog, but more finicky. Inspired as always, by John Meyers' The Land of Forgotten Cocktails column (do read his backstory on the drink to learn how the cartoon Tom and Jerry came to have their name), I tackled a more ambitious drink, involving whisking egg whites- by hand, ahem- and the words "be careful not to curdle." Hmm, sounds like a great idea to attempt after 4 cocktails. Fortunately, everyone else was 4 cocktails in as well, so if it was a little curdled or strong, it went largely unnoticed. Or largely unsaid. Whatever, same thing. I followed the Esquire magazine recipe, using bourbon instead of whiskey, because I'm apparently a "die-hard Dixiecrat," (and am OK with that). But I recommend using a larger glass, because between the bourbon soaked egg batter and the 2 oz. bourbon/rum per glass, in these cute short glasses, the drink was a little strong. Uke gave up on matching milk and egg based drinks with cheese and went with Ghost Pepper Chili Salt Chocolate Bark and Chocolate Covered Marcona Almonds. The salty, spicy, and sweet combination of the drink and the chocolates worked wonders. Uke also brought great pickled beet deviled eggs, that would make a nice, if not labor-intensive holiday potluck recipe. Again, we were so happy this year that all our cocktails turned out to be winners. I would recommend any of them to make for holiday parties or to spice up a slow winter evening. Many thanks to Dawn and Adam for hosting us, my fellow bloggers for contributing food and drinks to enjoy, and you for reading. Happy holidays! I have a problem, and its name is Taco Escobarr. Sigh. I'm thinking, on one hand, it's not *that* bad, and if you write a strongly worded review, you may come to regret it for many reasons. Maybe I'm just crabby because it's raining heavily, I didn't bring lunch (or a raincoat), I'm wearing cute flats and tights, and I parked alllll the way in the back of the lot. None of these things, however, excuse the greasy, declining taco experiences I've had at Taco Escobarr. I've eaten at Taco Escobarr, the newish, hip taco joint, opened by the Nosh Kitchen Bar guys, 7 times now. I've eaten at the bar, at the hightop tables; by myself, with loud groups, on a date; I've ordered burritos, all kinds of combinations of taco fillings, shells, and salsa. The only thing I haven't tried are the sides and desserts. At first, I was enamored. The tacos are cheapish (3 for $8 or 3 fish tacos for $10), the salsa are nice and spicy, and the bar environment is fun. They have Miller High Life, Busch, and Maine Beer Co. on tap (not a complete list). I had good experiences with the puffy tacos, which are deep fried soft shells that puff up and crackle wonderfully when you bite into them. I was into the picadillo or ground beef filling. So far we're firing on all cylinders for a taco joint. But then around my 5th visit, the puffy taco shell was greasy. And not very crispy. I thought, are they making these ahead? Sure enough, I peered into the open kitchen (past the not-to-busy-cooks, I might add) and saw a stack of pre-fried puffy tacos. That explains why my food came so very fast. My most recent nail-in-the-coffin visit saw a very long wait for our food (30 minutes), withering treatment from our server (including a scraping off of toppings when J. pointed out that she requested her tacos plain), and the dreaded combination of greasy, soggy puffy shells and dried out pork filling. However, most importantly (and infuriatingly), I will continue to eat there. The taco bar is centrally located when you're out for First Friday or other Arts District partying (and have temporarily OD'ed Otto pizza). 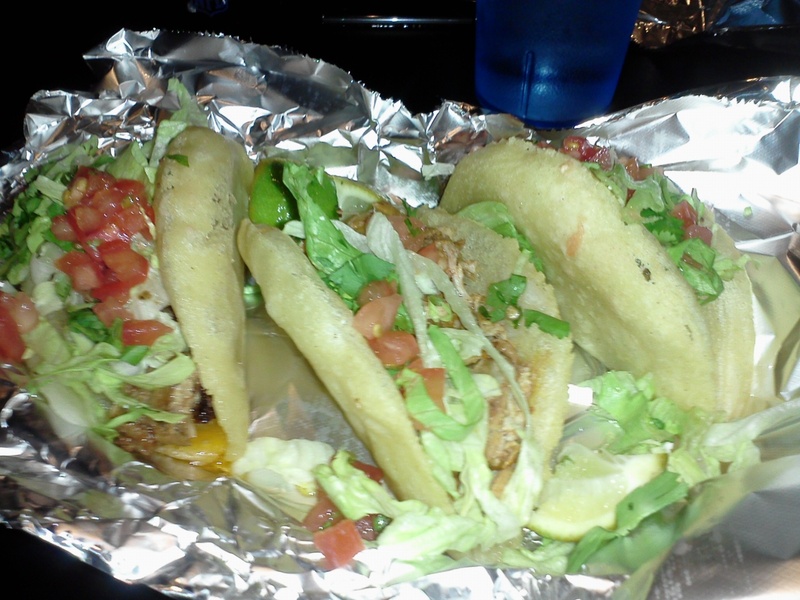 The tacos are cheap, better quality than $.99 tacos at Amigo's, and a crowd-pleaser if you're out with a group. Plus, there's an element of 'chasing the dragon,' in that I am hoping that their tacos will sing as they did on our first few encounters. I know this is going to be controversial, so let's hear it. What say you of Taco Escobarr? I vascillate between being too lazy to make my own breakfast (aka really wanting a bagel, aka hungover) and being too cheap to pay for a meal that takes 5 minutes to consume. Yesterday, I was in the too-broke-to-justify-a-bagel camp (I was not, however, hungover. Go me!). So I concocted this really quick, reasonable facsimile of a Mr. Bagel bagel with veggie cream cheese. I took about two heaping tablespoons of cream cheese, and mixed in grated carrot, broccoli, and onion. A little salt and pepper, and tada! White scala bread from Rosemont Market is the best. Now I just need this Everything Bread + Bagel topping from King Arthur Flour, and I'll never want Mr. Bagel again (...ok, I didn't meant that). I have mixed feelings about the Cook's Illustrated publications. While I am lured in by their promise of perfectly seasoned dishes at the end of the rainbow, I frequently find that the recipes don't mix with my style of cooking. Rarely do I pick a recipe, go to the store, purchase every single ingredient required and come home to make the meal. Rather, I poke around in the fridge and cabinets, browse through a few recipes, and mix what I have with a few recipes I saw. Sometimes this means I sub an onion for a shallot (oh, the horror) or white wine for vermouth. And this is where Cook's Illustrated and I fail to see eye-to-eye. Developed in 'America's Test Kitchen' these recipes have been deconstructed and tested from the ground up. So if they tell you to use a shallot, that means they've tried the recipe with yellow onions, without shallots, etc. When they say shallot, they mean shallot. And I'm ok with people who seek a Platonic ideal of every dish they make (the uber chili?). I'm just not one of them. Ultimately the point of dinner is to satisfy a need. And if I'm in a mood to take some time to make it in a tasty way? Peachy. But I don't have all night here, people. Nor a limitless bank account. Sometime the shallot becomes an onion. Recommendation? As a gift for a new cook, I'd rather give the Joy of Cooking or Bittman's How to Cook Everything. But this cookbook sure is extensive (800+ pages), has lots of great cooking tips that CI is known for, and may appeal to the cook that thrives when given meticulous, detail-oriented* instructions. 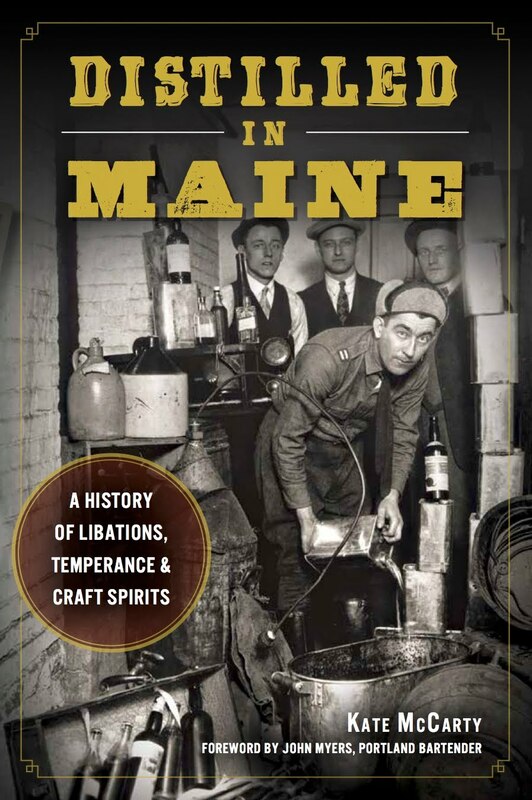 Thanks to Rabelais Books for providing the review copies for our Cookbook Review-o-rama. 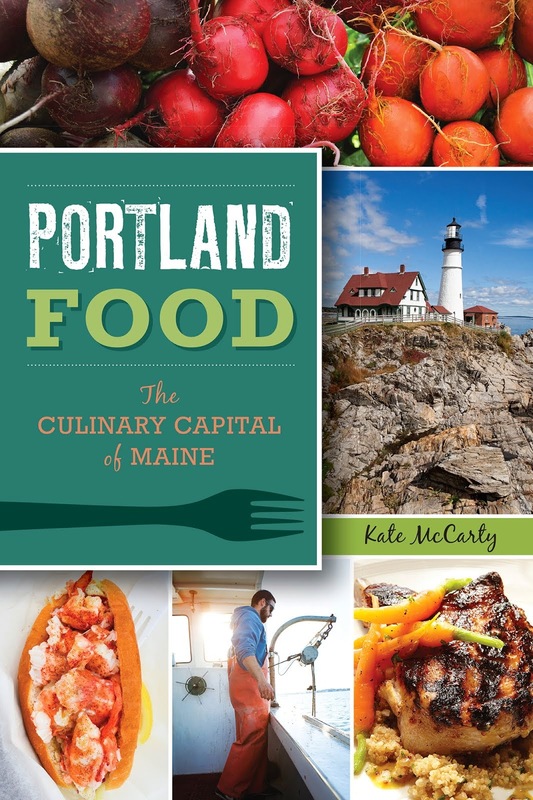 See the Portland Food Map for more book reviews from area bloggers. 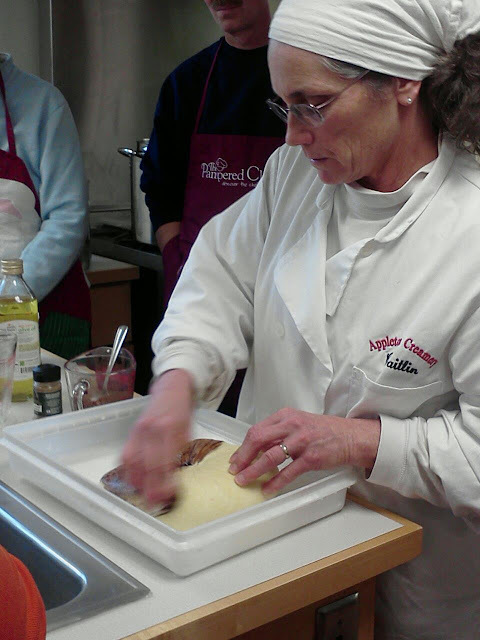 Yesterday, I took a cheesemaking class at the University of Maine, sponsored by UMaine Cooperative Extension and taught by Caitlin Hunter of Appleton Creamery. It was a nine hour (!!) long workshop and we made jack, ricotta, and mozzarella. We started with the jack, which is an aged cheese; it'll be ready in February or March. That took all morning, and then in the afternoon we made ricotta from they whey of the jack and a 30-minute mozzarella (similar to the process I learned at Wolfe's Neck Farm last year). Here Beth Calder, UMaine Extension Food Science Specialist (left) and a class participant, chat with Caitlin Hunter (middle) over 5 gallons of goat and cow's milk. The milk is resting in a sink full of hot water, as we slowly raise the temperature to 88*F.
Jack is a cheese that takes a mesophilic or 'warm-loving' starter. Adding a starter culture kicks off the acidification process (aka fermentation) and gives it that great cheesy flavor. After the culture was added at the right temperature and the cheese rested for a while, we added rennet. 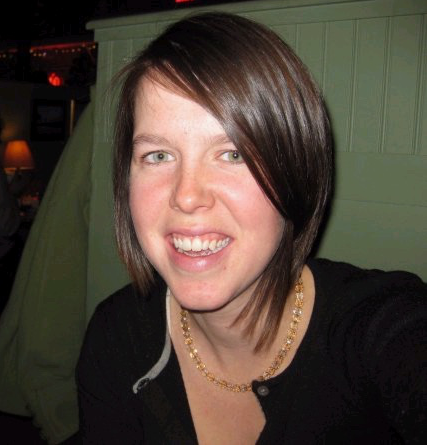 I learned a lot about rennet and its sources from Caitlin. Rennet is an enzyme that causes the milk proteins to coagulate or stick together and separate from the whey. Since milk is about 89-90% water, with the rest being fats and protein, the process of acidification and then adding rennet makes all protein come together in a solid curd and pull away from the whey. Here Caitlin is cutting the set curd into 1/2-inch squares, which helps even more whey be drawn out of the curd. The drier the cheese, the smaller the curd, since small pieces of curd have more surface area, which allows more whey to escape from in between the tangles of milk protein strands. We slowly heated the curd again, while stirring it, to help the curd shrink and release the whey. I could tell this step was where Caitlin's cheese making experience came in. Knowing when the curd was ready to be pressed requires a 'texture test' done by taking a handful of curd, squeezing it, and observing the results. When squeezed, the curd should stick together and the pieces should have the texture of cooked chicken breast when pulled apart. Caitlin frequently stuck her hand in the curd, swirled it around, and invited us to do the same to feel the curds bounce off the backs of our hands. This step took a long time, but once all the curd was sufficiently dried out, we let the curd rest for a few minutes and then strained the curd into a colander lined with a cheese cloth. After all they whey had been scooped off and saved for ricotta making, the curd dumping began in earnest. 5 lbs. of curd when into that cheese cloth! Then the curd was gathered up in the cloth, pressed firmly, attempted to be shaped into a round ball, and placed under a weight to rest for a few hours. The weight system was simple- two cutting boards above and below the cheese, with a large water-filled stockpot. The first pressing was 8 lbs. (a gallon of water), and then 25 lbs. (4 gallons of water). The jack cheese needs to be aged for a few months (in the refrigerator, even), so the cheese was raffled off to a lucky person- my boss! At first I was disappointed that I didn't get to babysit the cheese, then I realized that this really was the best outcome, as Kathy will take care of the cheese and then share it with me in March. Ha. Caitlin brought a jack she made a few days ago, that was ready to be oiled. 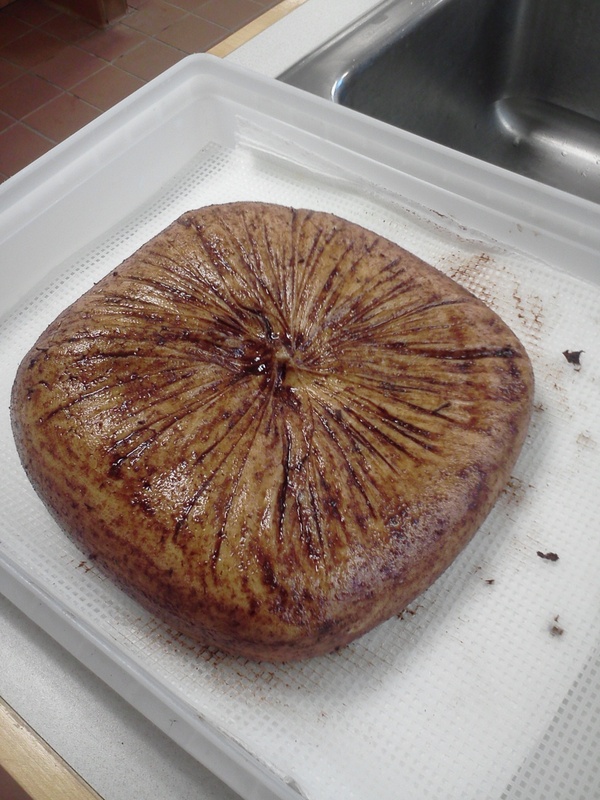 The cheese needs to be oiled every few days at the beginning of the aging process, so it can build a protective rind. Caitlin makes her oil rub out of cocoa, cayenne, and olive oil. Here's where you can get creative with spices, so Kathy is going to go with turmeric, cayenne, and olive oil. While this may seem like a lot of overwhelming steps that have a lot of room for screwing up, I actually feel like this is an accessible aged cheese for the beginning home cheesemaker. Ricki of New England Cheese Making has a nice picture tutorial of the jack recipe. When you see her do it, it looks so simple! I believe that I can replicate this cheese at home, and I'm excited to give it a try. As a bonus, when you're done all of that, you have a lot of whey left over, which is perfect for making ricotta. While we strained out most of the curd for the jack, there is still a lot left in the whey that can be drawn out through further heating and acidification. Additionally, you can increase the yield of the ricotta by adding some whole milk to the whey. All we did was heat the whey to 160*F, added some whole milk, kept heating to 180*F and added 1/4-1/2 cup of bottled lemon juice. 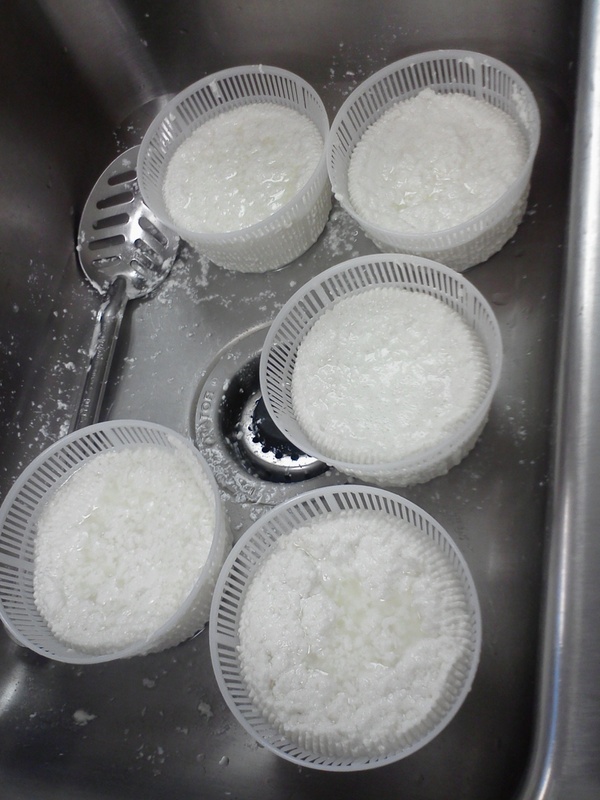 Then, as the curds rose to the top, we ladled them off into these cute little ricotta baskets and let them drain. Voila, fresh ricotta! Dead simple. Again, check out Ricki's tutorial for the recipe. Happy cheesemaking, kids! And if you ever see Caitlin's Beginner Cheesemaking Workshop offered in your area ($80), I highly recommend it. Totally doable skills. Lest you think I'm late to the party and trying to suggest pies for the Eating Holiday that just passed, know that I made this for no reason other than that I had a lot of spare apples and was headed to a friend's for movie night. And I'm no super baker- it's just easy to whip out an apple pie... assuming you have a few tools in your arsenal. I have used this cheddar cheese crust from Gourmet magazine in my BLT pie before. And it's a weird crust, especially if you sub in lard for the fat. It was all crumbly (even though I'd added plenty of liquid) and so I just powered through and forced it to roll out and lay nicely in the pie pan. Rather than stress over the aesthetics of the top crust, however, I used a snowflake cookie cutter to stamp out pieces and overlap them on top of the filling. This prevents the big hole that forms underneath the top crust when the filling inevitably shrinks during cooking. I love using a food processor for making pie crust, and then this diggly (an apple peeler, corer, and slicer) for peeling apples. So if you have a few tools, a delicious apple pie is within an hour's worth of work. My roomie J. made an apple pie the next day (apple pie off! ), and hers was better! She makes the Old Fashion Apple Pie from Simply Recipes, which uses an almond meal crust. And it rules. So two good options- and that cheddar cheese crust is to die for (tastes kind of like Ritz crackers). Happy holiday baking! It's almost turkey time, kids! Are you getting excited? I am. But that's because I'm going to Maryland to see my family, and I don't have to cook. I realize that's a weird thing for a food blogger to be excited about, but I'm happy to be skipping the canned vs. fresh, the traditional vs. updated spin, the brined vs. smoked debates. However, in my duty as a Portland food blogger, I seek to keep you informed of your local turkey options. If you're like me, you've left your research to this weekend. So here is a list of where to find a turkey and how much it costs, both to your wallet and your conscience. Just like last year, Trader Joe's is sticking with two straightforward options: brined or Kosher (both fresh, not frozen). Brined turkeys are available in 12-22 lb. 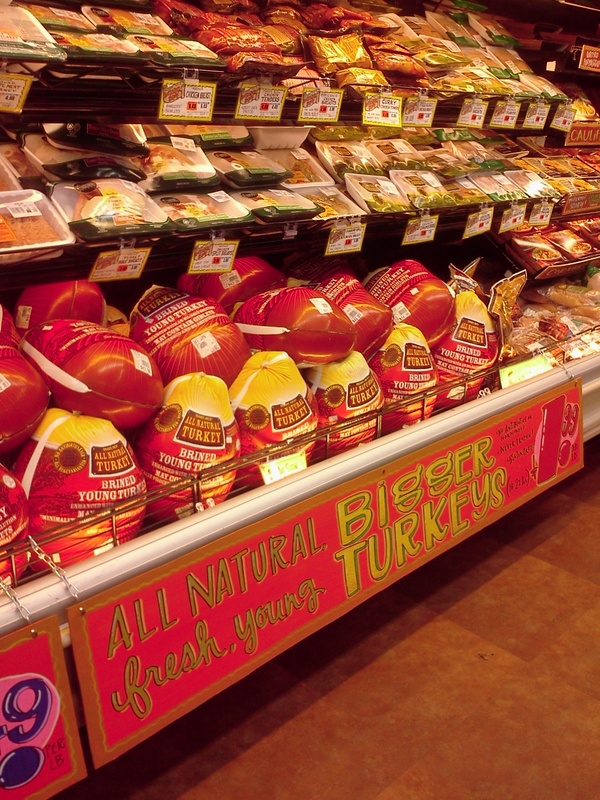 increments at $1.99/lb and Kosher turkeys are 12-16 lbs. and $2.49/lb. TJ's Turkeys are from U.S. farms in Minnesota, California and Pennsylvania and billed as 'All Natural,' which their website defines as "minimally processed with NO artificial ingredients, they never receive any antibiotics or growth hormones, and they are raised on a diet of 100% vegetarian feed." Note that the USDA does not allow the use of growth hormones in poultry or pork, so boastful claims of this are required by law anyways. 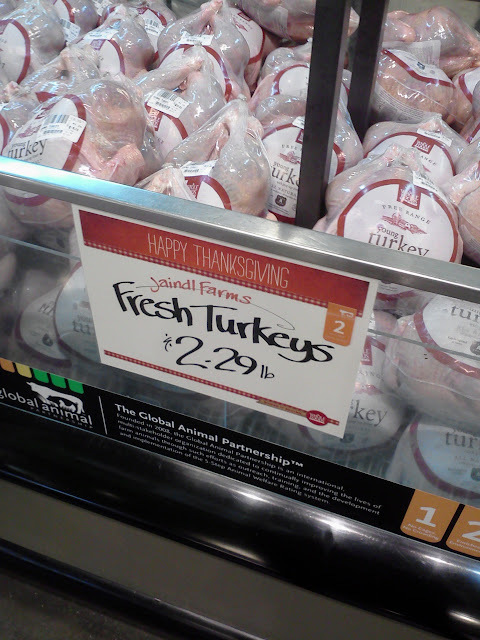 Whole Foods has three options for turkeys: fresh at $2.29/lb; brined at $2.99/lb. ; and all natural, free range, and local (from Misty Knoll, VT) for $3.99/lb, available in 12-20 lbs. Whole Foods' turkeys adhere to these standards: no antibiotics, vegetarian diet, no added hormones, no added solutions (except when brined) or injections, complete traceability to farm. I also heard the staff discussing breaking down a turkey for a customer, so if you are looking to feed a smaller amount of people, it sounds as if they'd be willing to cut the turkey up for you. Rosemont has turkeys available for pre-order and then available for pick up next Tues. and Wed. 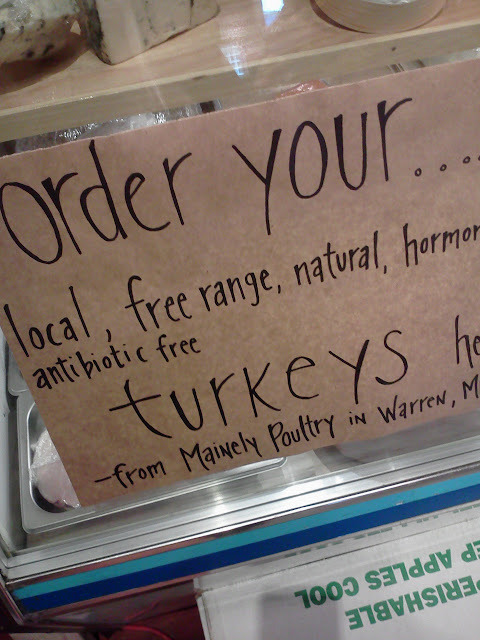 They are out of the Mainely Poultry turkeys, but just emailed to say they have turkeys from The Turkey Farm for $3.49/lb. If you've ever driven out 27 to Farmington, you've seen these turkeys! They live by the road in big screened-in pens. They look pretty happy (as happy as a turkey can look from the highway). The Turkey Farm does not use antibiotics, fillers, and uses vegetarian, GMO-free turkey food. Hannaford is where things get a little weird. Strange things happen at 7:30am at the Forest Ave Hannaford. There are 5 turkeys options at this store: Nature's Place at $2.49/lb, Butterball at $1.29/lb., Shadybrook Farms at $.99/lb, and Hannaford at $.99/lb, and Marval at $.49/lb. If you are concerned about the treatment of the animal, the Hannaford Nature's Place brand looks like it might be the only one that considers it. The others, not so much. Shadybrook and Marval are owned by Cargill, the number one privately held company in the U.S. in terms of revenue [Forbes]. Yikes! At $.49/lb (and available in up to 25 lbs!!) Marval turkeys are cheap. Enter the weirdness. Despite the 'Limit 1 per customer' sign, there were two men loading up carts with giant, cheap, frozen turkeys. They were discussing with a meat department employee the availability of cases- one man said he'd like 5 cases if he could get them. I snapped a phone photo of the turkeys and hurried on my way, lest they saw me eavesdropping, and I ended up wearing cement boots in the bay. 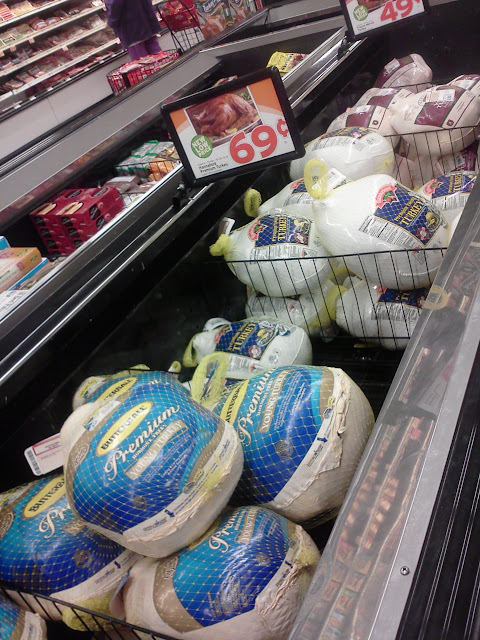 Hannaford also has Tur-duck-hens! They cost $50. So as usual, the most ethical, albeit expensive, turkey option is available through Rosemont. I think if you can make do with a smaller one, the Whole Foods or Trader Joe's options are nicely priced. If you have some feedback on the actual taste of any of these turkeys, I'd like to hear it. Also, Sharon at Delicious Musings does a nice round-up of local products to use in your dinner, and A. at the Portland Food Map has a Thanksgiving Resource Guide, including wine advice. I've become obsessed with pickles lately- or rather I've tapped into my deep obsession; it was always there. In Brooklyn last month, I pickled up two quart jars of pickles to bring back and share with my friend A. (also a pickle devotee). And last night, when I made a pickle snack plate, I realized I hadn't told you about my great new pickle find! An aside: someone was recently complaining about pickle plates from his childhood. Like, the ones put out at parties by people in the 60s and 70s. The pile of yellow sweet pickles to be avoided, the pickled beets aggressively staining all the pickles red... Sounds like the pickle plate needs a makeover. So here's what I think of three types of pickled products: McClure's dill pickles, and Brooklyn Brine's "Damn Spicy" dill pickles, and refrigerator dilly beans. I found the McClure's brand at Smorgasberg and tried tasty samples of their whole garlic and dill pickles and their Bloody Mary mix. I also picked up two bags of Dill chips, one spicy and one regs. So good (maybe not as good as Lay's Dill pickle chips, but close). That's right, Dill. Chips. Try 'em. What I didn't realize when sampling is that McClure's pickles seem to be pickled in a brine that is straight vinegar. That stuff is spicy! It makes you cough. But they're the best of the two cucumber pickles, with a nice garlic and dill flavor, and lots of crunch, since they're whole, small cukes. But Brooklyn Brine Co.'s Damn Spicy pickles? Are DAMN SPICY. Like too friggin' spicy. Just tastes like burning. Since you're fishing your pickles out from in between a jalapeno and a habenero, it's no surprise. But dayum!! There's a pickle flavor in there somewhere, but my tongue was scorched. I've never made refrigerator dilly beans, but when I had a small bunch of green beans from my CSA this summer, I decided to go for it, rather than fire up the canner. I used 2 cups water, 2 cups white vinegar, and a quarter cup of salt, plus a teaspoon of crushed red pepper flakes (add more if you like it Damn Spicy!). I also added the additional step of blanching the green beans. Since they weren't being cooked in the canner, I figured I should blanch them to get the right texture. After only a few days in the brine, with some garlic and dill, these beans were pickled! Different than dilly beans that had been canned, but just as good, if not better. They were so easy to make and ready to eat without feeling guilty for dipping into your stash of canned goods. OK, other pickle recommendations? And did anyone hear the legend that you couldn't eat a pickle and drink milk together or you'd throw up? I was so paranoid about barfing when I was little, that I wouldn't eat pickles and dairy within hours of each other, just in case. After my failed attempt at recreating the finicky momofuku compost cookies, I concluded that it'd be much easier to take your favorite chocolate chip cookie recipe and just add a bunch of your favorite snack foods and candy. So when I told someone I was doing so, they exclaimed, you're making garbage cookies! So apparently it's like, a thing. And I'm a little late to the party. These cookies aren't too 'garbage-y' (mmm, yum); in addition to chocolate chips, I added peanut butter M&Ms and crushed pretzels. I was after that sweet-salty combo I love so much. And I followed a tip I never have before -- I froze extra portioned out dough! Now I can have cookies on demand. My favorite trick being to partially cook them and serve them warm with vanilla ice cream. Yum. I just got back from the Deering Oaks Farmers' Market in Portland, where the stalls are thinning and the crowds are slowing, but there's still plenty of great produce. Brussels sprouts; all manner of squash; heaping piles of kale, chard, and cabbage; wooden crates of apples... even cherry tomatoes and green tomatoes still. And yet while we're experiencing a mild fall, there's a bite to the wind today, my fingerless gloves aren't cutting it, and my toes are cold in my Chuck Taylors. The signaling of a Maine winter to come is making me feel restless already, pent up, anxious about the winter blahs, and leaving me itching to do something, go somewhere. Fortunately I'm road tripping it down to Maryland for the holiday in a few weeks, so that small adventure might take the edge off. But I am realizing that for me to survive in Maine, I need to plan a winter beach vacation. Something in March or April to somewhere warm, to see friends I haven't in a while. I'm planning two baking and cooking projects today, so stay tuned for some sweet and salty cookies and some great sides for the upcoming potluck season. An old friend John used to make (and maybe still does) big batches of food and eat them for every meal. As you can probably guess, John was a bachelor at the time. As a happily coupled young twenty-something, I thought this was so strange. I was enjoying domestic bliss, staying in a friend's house that had a fully outfitted kitchen (they were real people, when at the time, I was long-term housesitting and/or living on boats). My then-boyfriend and I made elaborate meals in our borrowed house and ate well. The idea of eating the same thing for several days straight didn't appeal to me. I thought it a) really weird to eat spaghetti for breakfast and b) the more obvious one, that you'd get bored during your pasta-a-thon. But now, I totally get it. In addition to being really busy lately, I don't have anyone to cook with anymore. So the other day, that same then-boyfriend suggested I make this "ants in a tree" recipe. I have no idea what that name references (does it look like ants in a tree to you??). But this thin pasta (or bean thread noodles) is dotted with clumps of ground pork, spiced with garlic and ginger, and more subtly, soy sauce, Sriracha, sesame oil, and topped with tons of chopped green onions. Apparently it's Chinese comfort food, but it makes for a great dinner/breakfast/lunch/lunch/lunch run. Combine pork, 1/4 cup soy sauce, garlic, ginger, and Sriracha in a bowl. Mix until completely combined and let rest for 30 minutes. In the last 10 minutes, bring a large pot of salted water to a boil. Add the pasta and cook until al dente (about 5 minutes). While the pasta is boiling, heat a large cast iron skillet or wok over medium-high heat. Add vegetable oil and saute pork until done (no pink remaining). Add the 2 tablespoons of soy sauce and the drained pasta. Remove from heat and toss until combined. Serve with additional hot sauce, and garnished with green onions and sesame seeds. BBF Travels: I Ate New York. I'll keep it short; it was hard to experience all the wonderfulness of New York food, knowing that these things were hours away from my home. I can imagine it's painful only to read about as well. 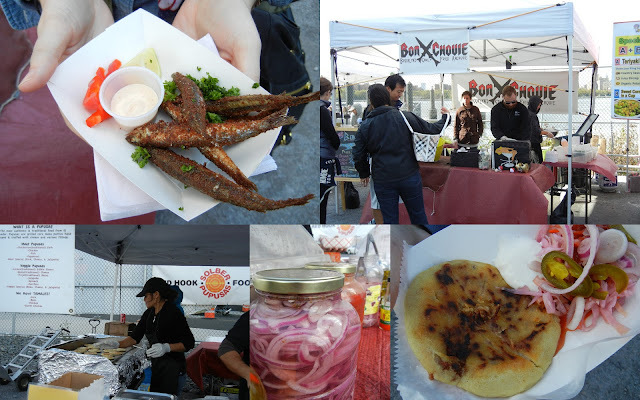 Smorgasberg, an awesome prepared and packaged food market in Williamsburg by the river. Radegast Hall after shopping on Bedford Ave. in Williamsburg (and the Bedford Cheese Shop). 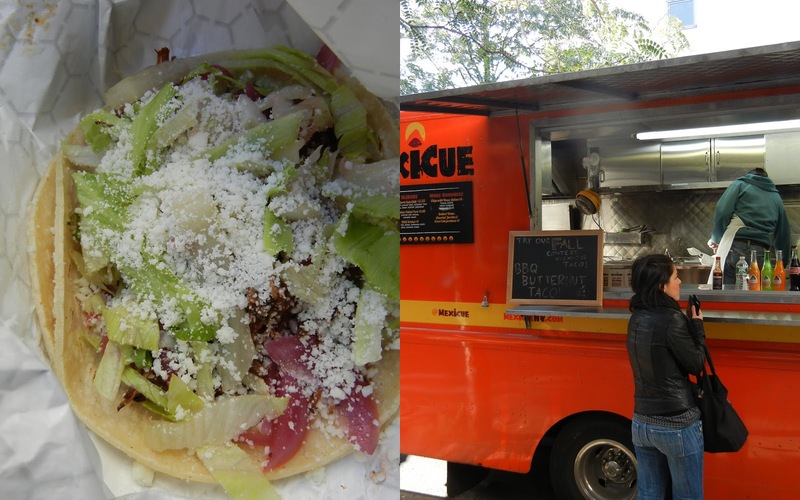 Food trucks on every corner, this one Mexicue and their short rib taco. 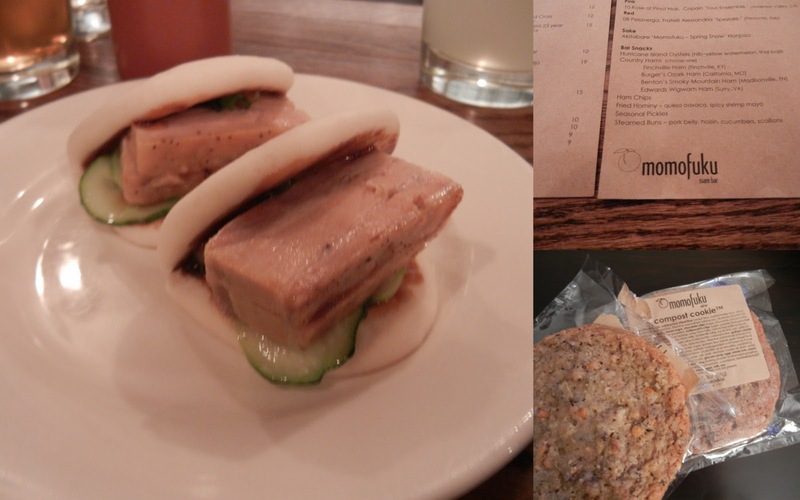 Momofuku saam bar and milk bar (pork buns and compost cookies, finally!). 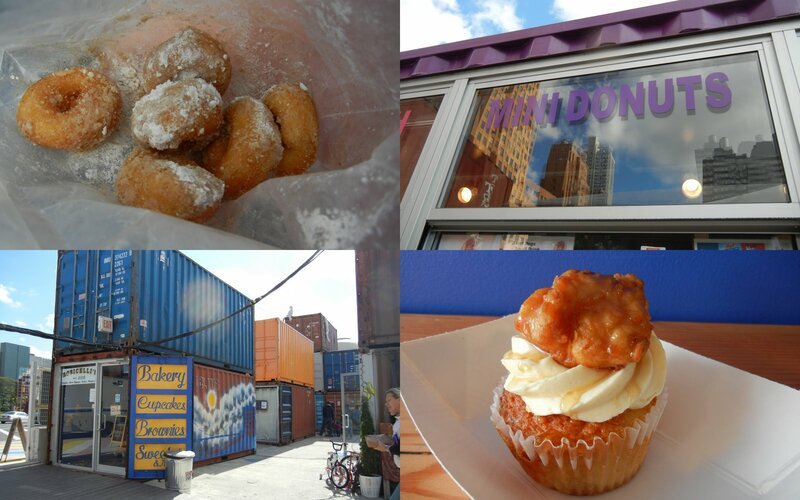 DeKalb Market with food stalls and tiny boutiques in converted shipping containers. And yes, that is a chicken and waffle cupcake. It rocked. The sweet Rose Water Restaurant in Park Slope.